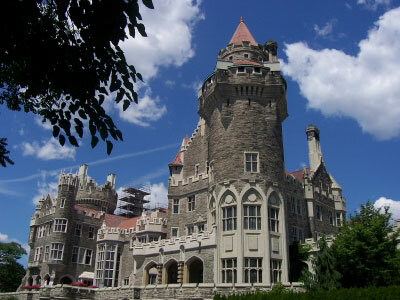 Casa Loma is a gothic manison built by Sir Henry Mill Pellatt. It is located midtown Toronto. The design is by E J Lennox and took three years to built. Due to the outbreak of World War I, the construction halted in 1914, but most of the manor was already completed. It has 98 rooms and is the largest private residence ever built in Canada. Today the house is open to the public, serving as a museum. The manor has stables, five gardens, a basement and three floors. On the third floor is The Queen's Own Rifles of Canada Regimental Museum. The house is operated by the Kiwanis Club of Toronto. On the border between New York and Canada there are three large waterfalls. 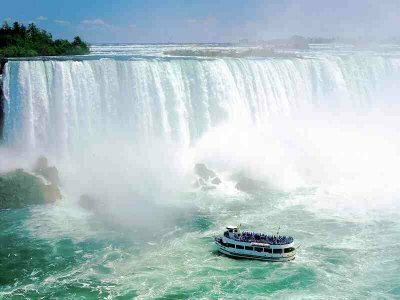 Horseshoe Falls, on the Canadian side of the border, is the largest. Together with the smaller American Falls and the Bridal Veil Falls on the American side, these waterfalls are among the most powerful waterfalls in the world. The drop is only about 50 meters, but the waterflow is massive. When the flow is high, up to 168.000 cubic metres of water topple the crest every minute. Millions of tourists come to view the falls every year. It is possible to get several good views of the falls both from the Canadian and US side of the falls. The most spectacular view is perhaps from the Maid of the Mist boat cruize, almost carrying people into the waterfall. 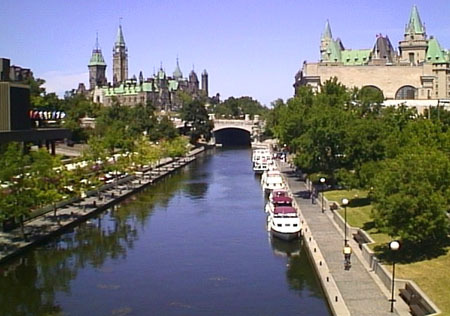 The Rideau Canal was built in 1832. It is a 202 kilometres long waterway, connecting the city of Ottawa to the city of Kingston. It was originally built as a safe communication route in case war broke out with the United States, but it also supported commercial interest. Most of the original structure of the canal is still intact, and it has been added to the list of UNESCO World Heritage sites. Today the canal is used as a recreational waterway. It is open for transport from May till October. There are boat tours offered from Ottawa, Merrickville and Chaffeys Lock. It is also possible for boat owners to travel the whole distance between Kingston and Ottawa.